The Native Persimmon by W. F. Fletcher was first published in 1915 by the United States Department of Agriculture as USDA Farmers’ Bulletin #685. 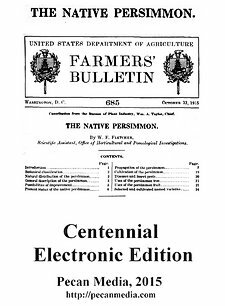 One hundred years later it remains the definitive guide on the propagation, cultivation, and uses of the wild/native American persimmon (Diospyros virginiana). This Pecan Media 2015 Centennial electronic edition of The Native Persimmon is the first electronic edition in modern ebook formats that are easy to read on any reading device. The entire fully-searchable text has been proofed and formatted to be displayed using whatever fonts, sizes, margins, and presentation that your reading devices allow. We at Pecan Press have been disappointed in the past by “ebooks” that turned out to be hard-to-read tiny graphical images of pages badly scanned from paper books. Pecan Press publishes only true full-text .epub and .mobi formats to make your electronic reading easy and pleasant. A list describing thirteen specific persimmon cultivars in use in 1915. We hope you enjoy this modern edition of The Native Persimmon. Thank you! Copyright © Pecan Media 2019. WordPress theme by Ryan Hellyer.